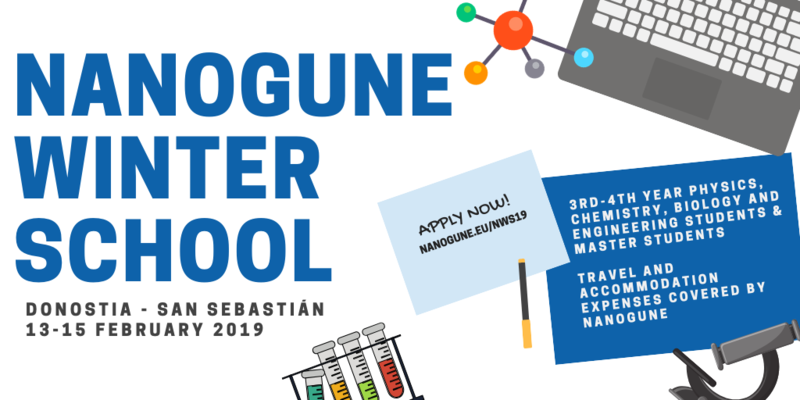 The nanoGUNE Winter School 2019 will be held in the nanoGUNE facilities in San Sebastian (Spain), from Wednesday 13 to Friday 15 February 2019. The event is primarily aimed at undergraduate and master students of physics, chemistry, biology and engineering. The School will include a combination of academic lectures, soft skills training sessions and hands-on lab practices. We will accept applicants until 15 November 2018.The applications received will be then evaluated and the results will be communicated no later than 15 December to all applicants. We are looking for highly motivated undergraduate or master students that are considering the possibility of pursuing their training with a PhD degree. The maximum number of participants will be limited to 30 students.